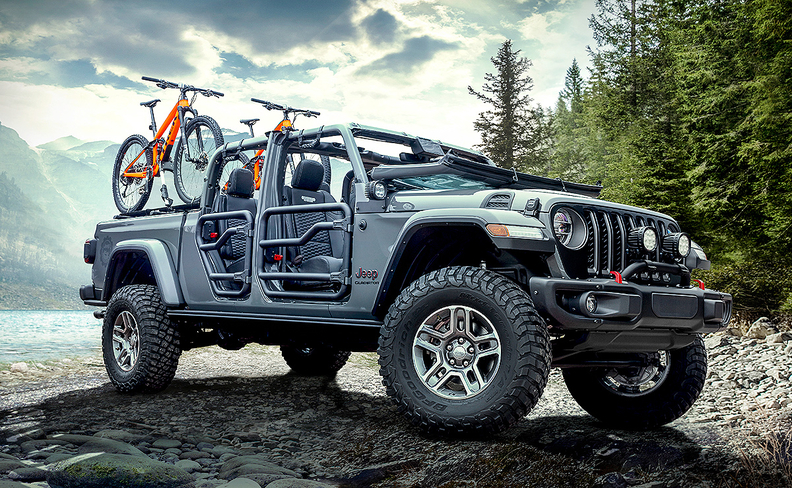 SACRAMENTO, Calif. — With a parts and accessories menu that'll exceed 200 options, the 2020 Jeep Gladiator could trigger an artistic wave of automotive da Vincis. That's how Jeep dealer Doug Wilson, who has a store in Collierville, Tenn., sees the new truck: not just as a rock climber and mud wrestler, but as a blank canvas that owners can "paint" with a personal touch and exhibit for the public, as many have done with the Wrangler. And he sees plenty of profit in that art market, too. "People will buy a Wrangler and then accessorize it to their own liking and do it the way they want it," Wilson, CEO of Wilson Auto Group, told Automotive News. "I think the Gladiator, with a lift and some 35s — people will be following you to gas stations, taking pictures and hanging out of car windows when you drive by." Indeed, the Gladiator could turn into Fiat Chrysler Automobiles' new accessory king. The Mopar parts unit expects the Gladiator to surpass the Jeep Wrangler and Ram trucks as the company's add-on leader, with eager consumers seeking to further distinguish a pickup that already stands out visually from the midsize pack. 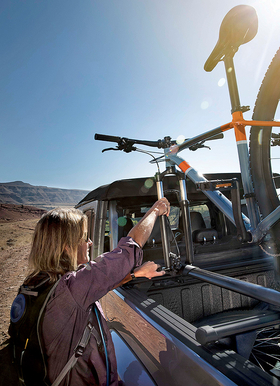 Racks to haul recreational items such as bikes are available for the new pickup. That could position the Gladiator, a premium choice in the segment, as an elite profit generator for FCA and dealers at a time when industrywide margins are tight. The Gladiator has a starting price of $37,040, including shipping, for the base Sport model with an automatic transmission, but can cross $60,000 when fully loaded. Kim Mathers, Mopar's head of accessories and performance, attributes the Gladiator's accessorizing appeal to the fact that it will draw from the "off-roading world and the truck world." "The industry is becoming more about personalization and customization, and owners being able to put their own mark on a vehicle to make it perfect for them," Mathers said last month during a media presentation here. Gladiator offerings, Mathers said, will center on truck functionality, lifestyle accessories and off-road capability. For the open-air contingent, for example, Mopar has steel-tube doors. Other customizations include military-grade LED lights and racks for recreational items such as bikes and surfboards. More than 90 percent of Mopar products will be available at dealerships as over-the-counter items at launch. Accessories will begin shipping to dealerships this month, ahead of the Gladiator deliveries starting in May, said Mathers. Some parts, called upfit options, will need to be requested by the dealership when the truck is ordered, and then added at FCA's Toledo, Ohio, assembly plant, or the Mopar Custom Shop down the street. Installing dealer-ordered Mopar accessories on vehicles shortly after they leave the assembly line allows them to be re-stickered with the accessory price included. Don Lee, a Jeep dealer in Maine, checked out a Gladiator in January at the NADA Show in San Francisco. Calling it a "hot-looking truck," Lee, president of Lee Auto Malls, thinks the Gladiator's accessory crowd will have the same preferences as Wrangler enthusiasts. He expects plenty of orders for lift kits and big wheels. "It's a similar customer as a Wrangler customer. We may see some pickup truck customers as well," Lee said. "I think we'll see similar accessories on the Gladiator. That's what these guys like."